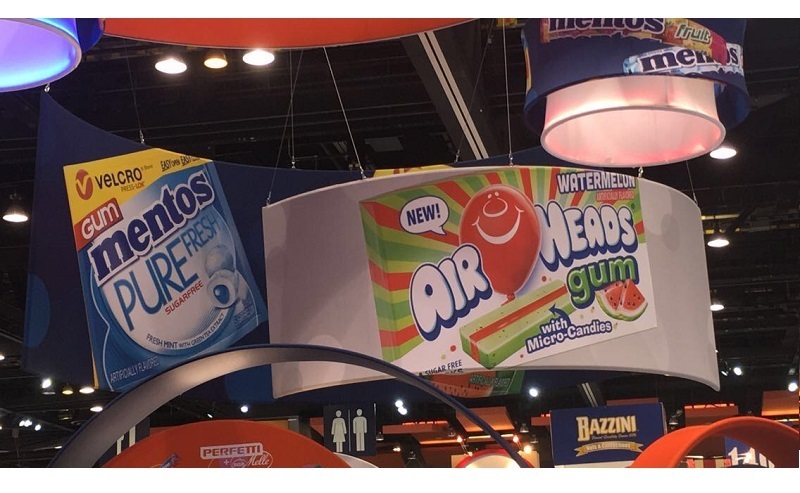 BOSTON – October 16, 2017 – Signaling Velcro Companies’ expansion into the candy and confectionery product category, the company today announced that the new Mentos™ Pure Fresh Gum Wallet Packs include the VELCRO® Brand PRESS-LOK® closure system. Perfetti Van Melle, confectionery and chewing gum manufacturer and distributor, has integrated the easy-to-use sensory closure into the pocket-friendly packaging to ensure the product stays sealed and fresh. Available in Fresh Mint, Spearmint, and Watermelon flavors, these new wallet-sized packs contain 12 pieces of sugar-free Mentos™ Pure Fresh Gum, known for its long-lasting freshness and flavor. The PRESS-LOK® closure featured on the new pouches has a thin profile so consumers can easily fit the small package into their pocket or handbag. The VELCRO® Brand PRESS-LOK® closure system is a proprietary hook-to-hook technology, made especially for the flexible packaging market. With just a squeeze of both sides, PRESS-LOK® closures easily align to create a secure seal that consumers can both feel and hear. Mentos™ Pure Fresh Gum Wallet Packs with VELCRO® Brand PRESS-LOK® closures will be available nationwide in November. Visit www.Mentos.com to find a retailer near you. Mentos is in 159 countries on this planet alone, so it’s fair to say Mentos is a global brand. Mentos comes in a lot of different shapes, flavors, and sizes, so there’s something for everyone and every taste. A lot of other brands out there obsess about what makes us all different; we’d rather explore the things we have in common. The Mentos brand is well-known. And it’s well-loved too. So wherever you go, one thing you can be sure of when you meet someone new is that they love Mentos. This means that if you have Mentos in your hand you have the ultimate conversation starter, a sure way to make a connection. All you need to do is offer. After all, who says no to Mentos? Perfetti Van Melle Benelux B.V. is a privately owned global company that was established in March 2001 through the merger of Perfetti SpA and Van Melle B.V. manufactures, and distributes sugar confectionery and chewing gum products in more than 150 countries. Today Perfetti Van Melle is one of the world’s largest confectionery groups, marketing highly renowned brands such as Mentos, Frisk, Chupa Chups, Smint, Fruittella, Alpenliebe, Golia, Vivdent, Airheads, Happydent & Big Babol. The Group has corporate headquarters in Italy and The Netherlands. U.S. operations are solely operated out of Erlanger, KY.